Let’s have a taste of Thai nutrition today! This is a very healthy vegetable salad with sweet, crunchy red cabbage, red capsicum, carrots, ginger and edamame beans for a Japanese twist. You’ll simply love the peanut butter and sesame oil dressing! Peanut butter has fibre, vitamins, protein and healthy fats. The best peanut butter to use is the one with no hydrogenated fats and sugar. Add some coriander and/or ground peanuts for extra flavour. This salad is delicious as a complete lunch meal or appetiser. Enjoy! 1) First, cook the edamame beans and remove them from their pods. Chill and set aside. 2) Next, grate the carrot and chop the red cabbage and red capsicum. Shred the ginger. Set aside. 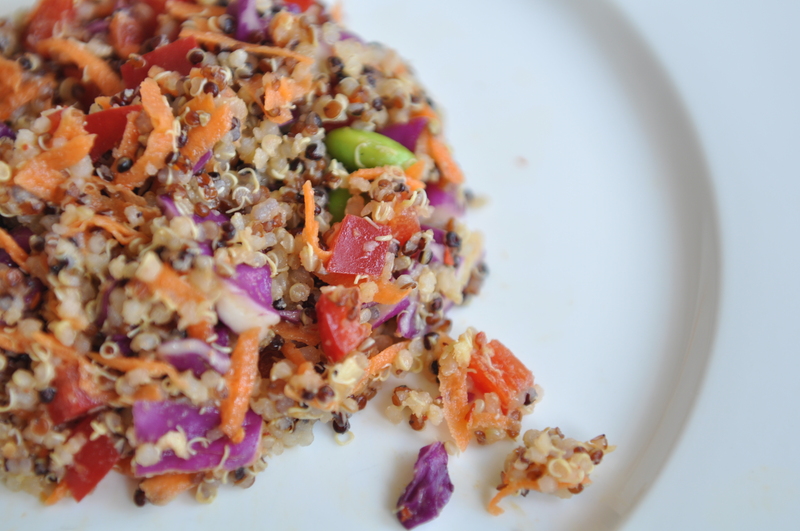 3) Pour the chilled quinoa into a large bowl and add the carrots, red cabbage, red capsicum, ginger and edamame beans. Set aside. 4) Next, make the dressing. Start with peanut butter. Add the peanut butter, honey and sesame oil into a bowl. 5) Then, squeeze the strained lime juice into the bowl. 6) Mix well with a spoon until smooth. 7) Pour the dressing over the salad and mix thoroughly. 8) Season with salt and black pepper according to taste. 9) Grab your fork. Serve and enjoy!